We Are Supposed To Be Having Fun! This weekend was the Fall Festival in our town. We don’t have the standard summer carnival, instead we have a big event for 3 days that includes carnival rides, music, food, crafts and games. It’s a pretty big event for our little city and of course it seems like the perfect way to spend a Saturday morning if you have kids. Or I should say, if you don’t have our kids. 1. Food Allergies. First and foremost pretty much all delicious carnival food is a no no. All those peanut oils and chocolates and deep fried foods are all a danger to Charlie and being in the air is enough to make me almost insane. Peanuts are one of those great food allergies that become environmental when cooked apparently so there’s the fear that random peanut proteins will jump from the fryer and into Charlie’s mouth, eyes or nose. Plus Charlie thinks ground food is equally if not more edible than normal served at the table food so I’m on extra alert. 2. Motion Sickness. Charlie gets car sick. He has now vomited twice in the car and complained of being sick and hot numerous times while driving. Needless to say, one ride and he was done. I’m honestly amazed he made it on one. 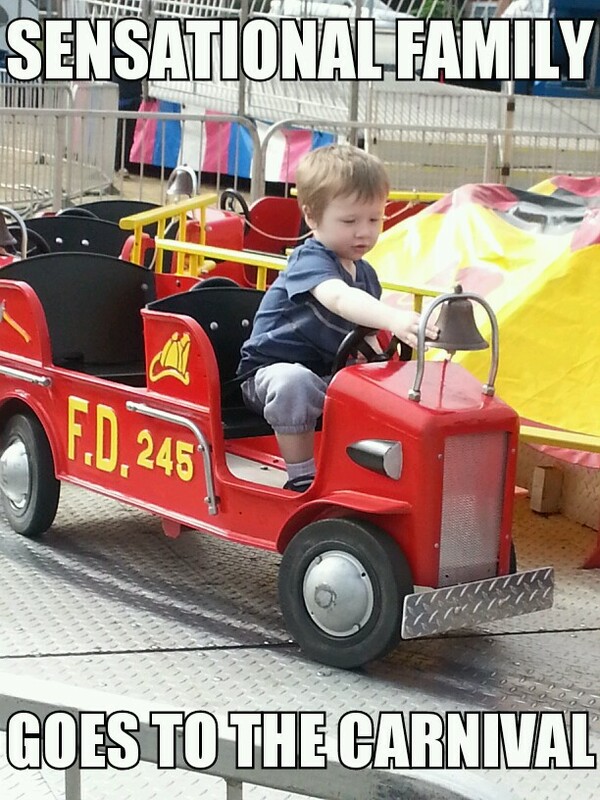 It’s the first time he’s been on a carnival ride by himself. And probably the last time. I can’t tell you how many times we do things that are “family fun” oriented and end up leaving stressed, tired and with cranky kids. Molly tries her best but when push comes to shove, she can’t regulate that much stimulation so she ends up trying to soothe herself which means she ends up trying to hang from all my limbs or asking to be carried. Have you ever carried a 35 pound 4 year old for a prolonged period of time? I have. More than once. I have carried her through the zoo, I have carried her through the tractor show, I have carried her on walks around the block and I saw myself carrying her from our Fall Fest. It was coming: the whining, the hanging and the carrying. You could see it in her deteriorating behavior and we quickly opted to leave, unused ride tickets and all. Then there it was…. the playground. An entire carnival the kids want nothing to do it with but a playground?? Hells yeah! After 10 minutes and Charlie trying to play in a near by dumpster and throwing himself on the mulch face first in a fit, we quickly gathered the kids and headed for home. I hope the kids remember these times fondly, as we have no real pictures of the kids not enjoying are family fun outings.